Click above to see a larger image. 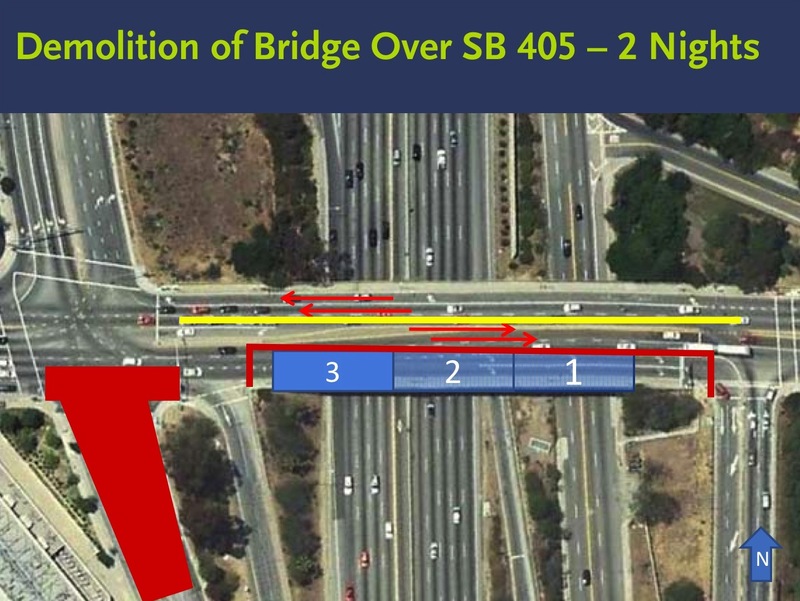 Yet another friendly major infrastructure improvement reminder: Work begins on the run-up to demolishing the Sunset Boulevard bridge over the 405 on Friday night. The tear-down is part of the Sepulveda Pass Widening Project that will add a northbound carpool lane to the 405 between the Santa Monica and Ventura freeways. Scheduled opening is spring 2013. The bridge is not — I repeat, IS NOT — being torn down all at once. Instead, the work beginning on Friday is to reconfigure the bridge from six lanes to four. The two southbound lanes will then be demolished in three different phases, as shown in the graphic below. Because the bridge is losing two lanes of traffic, there could be delays — even with six lanes, it’s not as if traffic flowed easily through the area. The above map shows suggested detours around the construction zone. The major demolition work is being planned over six nights, with three other nights scheduled as a contingency in case work doesn’t proceed that quickly. Those dates will be available later. There’s a good presentation online at the project website that looks at some of the issues and the construction workflow in the area. A press release with more details is after the jump. Click above to see larger image. Marking the first major construction deliverable for the I-405 Sepulveda Pass Widening Project, contractors are poised to begin preparation work for the future demolition and reconstruction of the Sunset Bridge in West Los Angeles. Starting Friday, May 7, workers will reconfigure traffic lanes and signals on the Sunset Bridge. Lane reconfiguration work will be conducted at night between 9 p.m. and 6 a.m. and is scheduled for completion the morning of Monday, May 10. At this time the Sunset Bridge will be narrowed from three lanes in each direction to two lanes in each direction to enable the contractor to prepare the bridge for demolition. Concrete barriers will be placed on the bridge to separate the work zone from traffic. The contractor also will secure and protect existing utilities within the bridge, remove internal formwork, perform a bridge inspection, remove area vegetation and create a staging area for construction equipment. The demolition schedule will be dependent on what the contractor encounters during preparation activities. Demolition could begin as early as the end of May. However, if bridge conditions require additional preparation work, demolition will be scheduled in June. 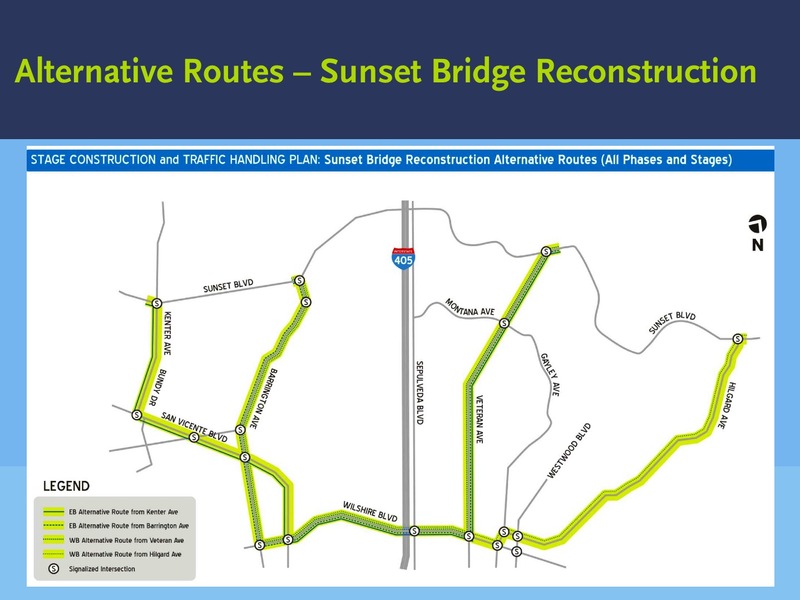 Sunset Bridge demolition and reconstruction will be conducted in two separate phases. The southern side of the bridge will be demolished first. That will be followed by approximately 10 months of south side bridge reconstruction. Upon completion of the south side of the bridge, the northern side of the bridge will be demolished and rebuilt in the same manner. While the bridge will be closed during demolition, it will be opened to traffic during reconstruction. During reconstruction, there may be nights when traffic is restricted. Notification of these traffic restrictions will be provided in advance. The major demolition of the bridge will be conducted over six nights, with three additional nights planned as a contingency. The first two nights, the portion of the bridge over Sepulveda Boulevard will be demolished, and Sepulveda Boulevard will be closed. The second two nights, the portion of the bridge over northbound I-405 will be demolished, and the northbound I-405 will be closed. The final two nights, the portion of the bridge over southbound I-405 will be demolished, and the southbound I-405 will be closed. Additional demolition of the bridge abutments and center column will occur approximately one month after the initial demolition. Access to surrounding local streets, the freeway and freeway ramps during demolition will be impacted. To keep traffic moving, detours will be set up and traffic control officers will be stationed at critical locations to help direct traffic. Detailed information on all closures, including detours, will be made available in advance on metro.net/405. Emergency vehicle access will be maintained at all times. Construction work is being coordinated with Caltrans, City of Los Angeles, utility companies and other construction projects in the area to minimize impacts as much as possible. When completed, the expanded, seismically enhanced Sunset Bridge will be widened by approximately 30 feet. It will contain additional lanes to improve area traffic flows, and its columns will be repositioned to accommodate the additional freeway lane created by the project. The Sunset Bridge is the first of three major overpasses to be replaced as part of the three and a half-year construction project. The Skirball and Mulholland Bridges are also scheduled to begin demolition later this year. As a design-build project, construction schedules are dynamic and subject to change. The latest construction updates will be made available on the project web site and on Twitter at twitter.com/I_405. The $1 billion project, a joint partnership between the Los Angeles County Metropolitan Transportation Authority (Metro) and Caltrans, will create a 10-mile carpool lane on the northbound I-405 between I-10 and U.S. 101 Freeways. The project will add capacity to one of the busiest freeways in the region and make it safer. Other project enhancements include the improvement of supporting freeway infrastructure such as ramps and sound walls, and the widening of freeway lanes that connect with both the I-10 and U.S. 101. For additional project information and ongoing construction updates, visit www.metro.net/405 or call the project hotline at 213-922-3665.